In my more than 20 years in this specialised field I have found that the greater majority of cases that are compromised, tend to be damaged as a result of the First Responder's choices and actions. 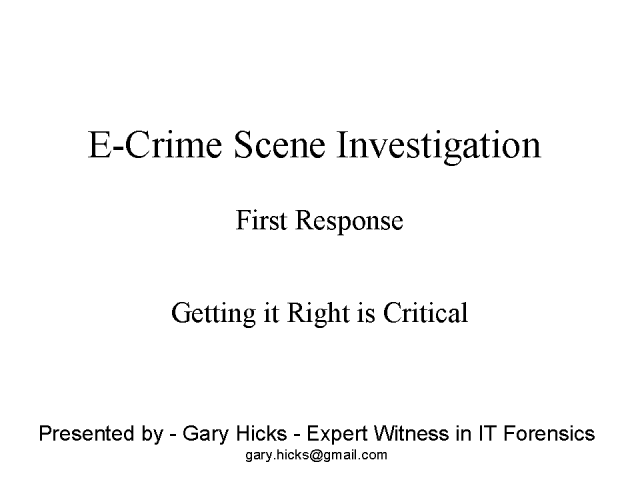 As you know electronic evidence and the discovery of it (e-discovery) is often transient, easily obliterated or compromised, and devilishly hard to appreciate for the uninitiated. You never have an e-discovery expert when you need one and business must go on. The result is usually an uphill battle for the e-discovery expert when they are finally brought in. As this Scene of Crime is often the first that is known about the problem and the discoverer is rarely able to adequately deal with the issues at hand. In my webcast I would like to guide the participants through the process and around the pitfalls so that more choices are available to the victims and the quality of the evidence is preserved.